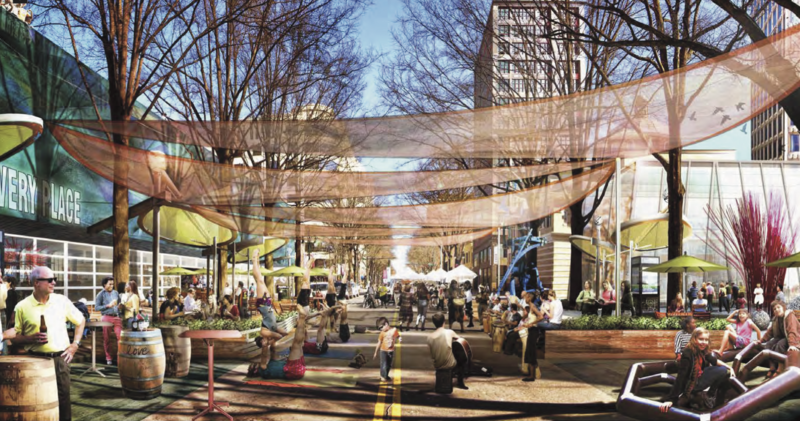 The North Tryon Vision Plan centers on creating a district that will attract, retain and strengthen creative industries, innovative arts and cultural and educational institutions. Together, these forces will advance the economy and jobs of the future. 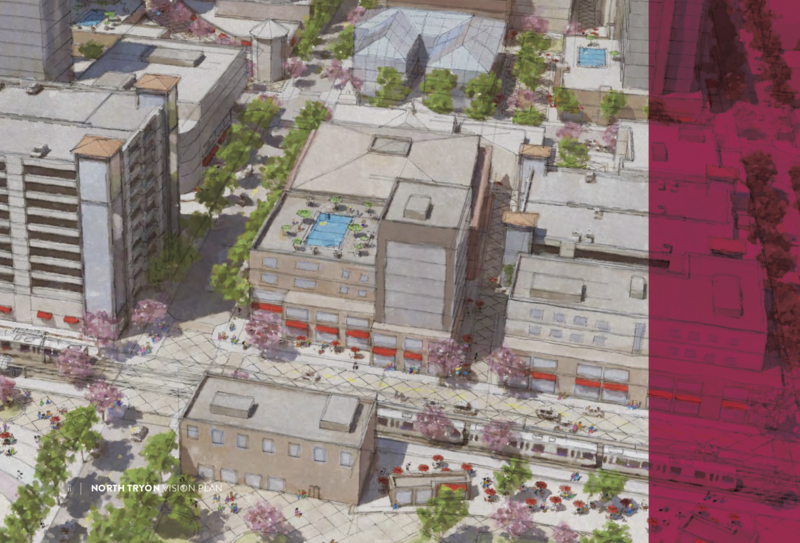 Strategically positioned in the heart of Charlotte, North Tryon will connect the thriving core of Uptown to the countless opportunities of the North End and Applied Innovation Corridor, as well as link together the unique and diverse First and Fourth Wards. A rendering of proposed massing in the North Tryon district shows new, high-density development with varied heights and architecture. The red awnings indicate key locations for street-level retail. Uptown Charlotte is the heart of an exciting, dynamic city center and a thriving region. While many parts of Uptown and Tryon Street are enjoying great success, several areas remain largely underutilized and underdeveloped. Encompassing approximately 50 square blocks of Uptown, North Tryon contains the greatest concentration of arts and cultural institutions in the entire region. Between Mecklenburg County’s Hal Marshall site, Levine Properties’ land holdings, and several large, vacant parcels, North Tryon also represents the largest and most exciting development opportunity remaining in Uptown. The need to differentiate North Tryon from existing Uptown offerings does not stop at housing or employment. South Tryon, with The Levine Center for the Arts and nearby attractions, is a major destination that provides a high quality arts and cultural experience. North Tryon can complement South Tryon while contributing something a bit different. The area should encourage residents, workers and visitors to actively participate in arts, culture and other creative offerings. 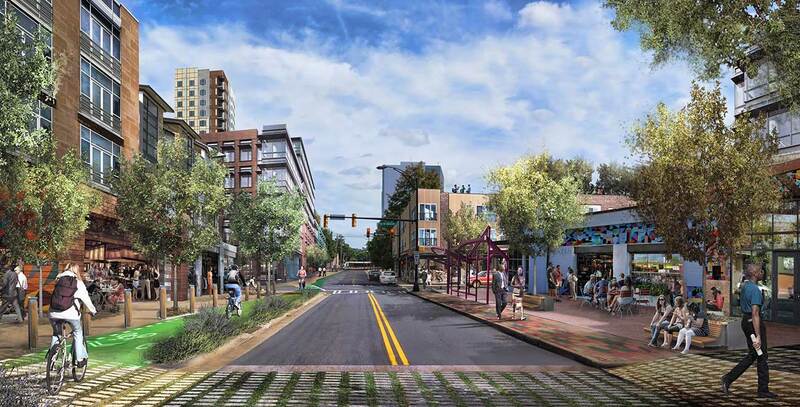 North Tryon should be a place where all community members can play an active, participatory role in an ever-evolving, surprising, dynamic experience. an extension of the new Spirit Square plaza.